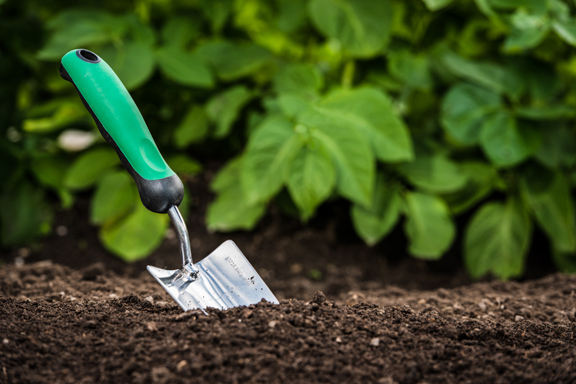 Loosen the garden soil to a depth of about 12 inches with a tiller or shovel two to four weeks before your area's last frost date, or at the end of summer, 10 to 12 weeks before the first frost date. Mix a 1-inch layer of mature compost or 1/2 inch of vermicompost into the soil. Sow carrot seeds 2 inches apart and 1/4 inch deep. Space rows 6 to 10 inches apart. Water the carrot seeds until the soil feels moist. Do not let the soil dry out. Covering the seeds with a wood board helps reduce moisture evaporation. Remove the board as soon as germination occurs. Watch for germination 10 to 25 days after sowing the seeds. Thin 1-inch carrot seedlings to 4 to 6 inches apart. Fertilize the carrots when the tops reach 3 to 4 inches tall, and then fertilize again at 6 to 8 inches tall. Use a fertilizer with a 5-10-10 or 1-2-2 nitrogen-phosphorus-potassium ratio. Do not over fertilize as this may cause forked roots. Cover the shoulders, or tops, of the carrots with mulch if you do not plan to harvest them immediately. This prevents the carrots from turning green. Loosen the soil around the carrots with a digging fork before harvesting. Harvest carrots when they reach 3 to 7 inches in length. Smaller carrots have a sweeter flavor. If temperatures stay above 20 degrees Fahrenheit, you may leave the carrots in the ground until you want to use them.